A sequel to the 2014 hit action flick based on the 1980s TV series (of the same name). 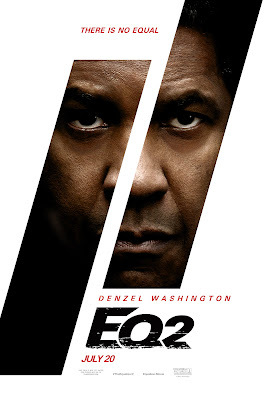 Denzel Washington returns as Robert McCall, a retired CIA Black Ops operative, turned vigilante, who this time wants revenge for the murder of a friend. The sequel was once again directed by Antoine Fuqua (a usual partner of Denzel's, many times now), and Richard Wenk also returned to write the screenplay. The movie costars Pedro Pascal, Ashton Sanders, Jonathan Scarfe, Melissa Leo and Bill Pullman. It's gotten mixed reviews from critics, and it's projected to be a modest hit at the Box Office as well (the first one was a big one). I really enjoyed the third act, but not so much the first two. Robert McCall (Washington) is now working as a Lyft driver, who sometimes acts as a vigilante still (especially when he picks up a woman who's been assaulted by a group of young privileged white men). Then one day Robert learns that his good friend Susan Plummer (Leo) has been murdered. He of course investigates the crime, and learns that an old associate was involved. McCall of course then returns to his violent vigilante ways full time, until revenge is accomplished. The movie is really slow-paced and uninvolving (at least in my opinion) for more than fifty percent of the film. Then it picks up though, at about the beginning of the third act. There are some entertaining and interesting moments before that, but I was mostly bored with the movie until the big climax. The climax is pretty cool though, and there's some awesome Denzel action hero moments in it. The scene where Denzel gets revenge for the assaulted young woman (early in the film) is pretty cool too. It's not as good as the original definitely though, or as entertaining as most Fuqua/Washington action flicks are.